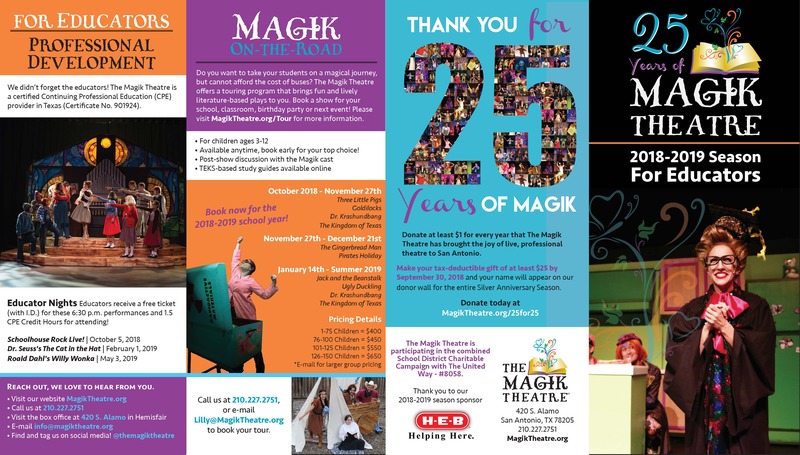 We’re looking forward to seeing you and your students at The Magik Theatre! Please take a moment to review these helpful hints about our reservation policies and ways to ensure the day of your field trip is a smooth one. Immediately after the performance (most school programs held from Oct-May), a 10 minute talkback and Q&A is held by the cast that meets important TEKS standards and compliments our study guide for each show. Call the box office 210.227.2751 for assistance with your group purchase. Ask about how your classroom can take a backstage tour! You will receive for every 10 student tickets purchased, you will get one FREE teacher admission in your group reservation. Please note, effective September 1, 2018, all ticket prices will include a City of San Antonio Facility Fee on all tickets. 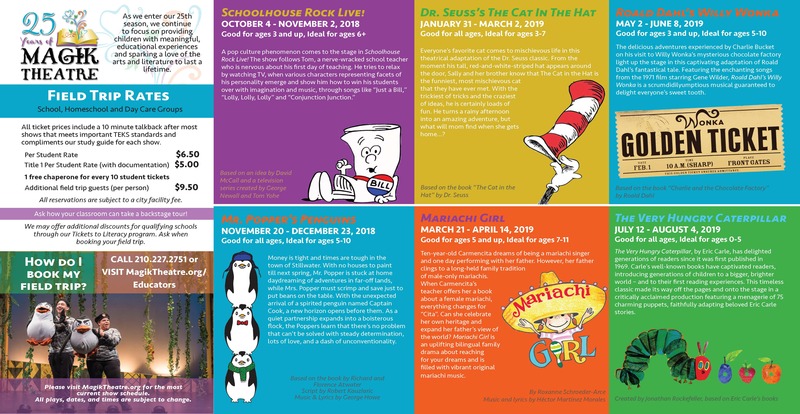 These prices are good for school shows during October 2018 through May 2019 (Rates vary for performances held during Spring break/Thanksgiving/Christmas break and other holidays). Group rates vary for our Summer program and during holidays start at $10 for groups of 10 or more. For questions or to make your reservation, call (210) 227-2751. Once received, please review and sign your field trip invoice, then e-mail or fax it to the Theatre within 2 days of booking your field trip. A 25% deposit (or the full amount, if your school prefers to only cut one check) must be paid 30 days from the date you confirmed your reservation. Seating is based on availability and payments received. The balance must be paid on the day of your performance, please arrive early for check-in and to arrange for your tickets. (For quicker check-in to avoid any delays, payment in advance is preferred). The Theatre does not accept purchase orders, all accounts must be paid in full at check-in. No refunds are given the day of the show. Refund check request will be submitted and payment made within 4-6 weeks. Please call the Theatre immediately if you have any changes to the performance date, number of children or adults, or special needs. To decrease your ticket numbers, you have up until 2 weeks before the show date. No refunds will be made after final confirmation of seats. To increase your ticket numbers, please call the Theatre ASAP, and we will do our best to accommodate your extra guests. Our staff will e-mail or call you the 2 weeks prior to the week of your show to confirm your numbers. Please respond no later than 2 weeks before your show date to ensure we have the correct number of seats reserved for your group. You may drop however many tickets you need to by 2 weeks before the show date without paying for the tickets that you drop. Final count is due 2 weeks prior and no adjustments can be made on the day of the performance. No refunds can be made on the day of the performance. If you have any major changes to your order, please call the box office at (210) 227-2751. Please read the following 2 options carefully and communicate our policies to your parents prior to attending. If you want the parents to be guaranteed a seat with your group, you must include the parents in your adult ticket request at the time of your group reservation. Teacher/organizer must collect the $9.50 per ticket from the parent(s) and payment must be included in your final payment to the box office. We recommend giving parents a deadline (3 weeks before your show date) to turn in their money to the school so you are able to have a final count. If you select this option, your parents do not need to contact the Theatre. If you prefer that parents reserve directly through the Theatre, they will not be seated with the group/child and will most likely be seated in our balcony so that we may give priority seating to students. We highly recommend that parents reserve their tickets as far in advance to avoid possible sold-out performances. Tickets can be purchased online or by phone at (210) 227-2751. It is not recommended that parents purchase tickets on the day of without calling the box office to confirm availability. If your parents will be reserving through the Theatre, please consider using the parent note template (in English and Spanish) provided by our box office to ensure all parents are aware of our policies. After unloading, buses and commercial vehicles are not permitted to stay parked alongside the curb of Alamo Street in front of the Theatre during the show. Free parking for buses is available nearby at the Alamodome, Lot A. For information regarding the Alamodome bus parking, call (210) 207-3680 or visit http://www.alamodome.com/plan-your-visit/disabled-services. The Alamodome allows school buses to park in its Disabled Parking Lot (Lot A), unless there is a large event going on that requires the parking lot. If the Alamodome lot is unavailable, alternate bus parking can be found on Camaron Street between Martin Street and Travis Street. It is on-the-street parking reserved for buses (the closest address is 450 Camaron Street). There is signage along the street that says “Reserved for Tour Buses”, but the City of San Antonio has confirmed that this area is available for school buses as well, and is free of charge. There are also 1 or 2 bus parking spots along Nueva Street, which is the street at the end of our building. Parents should plan to arrive early to park at nearby parking lots (Rates vary from $5-$15). The Theatre does not have a dedicated parking lot. A daytime parking map for parents can be found in our Parking and Directions page. Doors will open 30 minutes prior to show time for weekday performances. Please plan to arrive at the time the doors open to avoid any delays or late seating. Teacher/organizer must check in the box office as the group/classes are getting lined up by Magik Theatre Staff. The teacher/organizer will pass out tickets to the parents/teachers that are included in her group count. Parents who wish to purchase or have purchased tickets in advance should plan to arrive early and check in at the box office. Please note, if you are not part of the reservation made by the teacher/organizer, you will not be seating with the group. If you plan to eat lunch after the show, you may leave your lunches in our 2nd lobby against the wall during the show. The Yanaguana Garden playground and park is located right next to the Theatre and is a great place to enjoy a picnic lunch before or after the show. As we get closer to your show date, you can find study guides for each show and grade level at the bottom of this page. Thank you for your reservation, and enjoy your visit to The Magik Theatre! Click HERE to submit a request for a school field trip for our 2018-2019 25th Anniversary Season! For 2018-2019 season study guides – click here. For our Educator Brochure tour and educator night information – click here. For our Educator Brochure season information – click here.